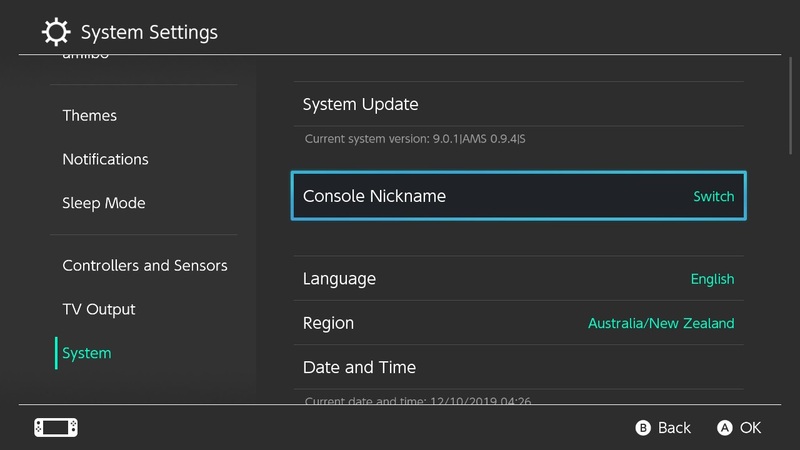 Now that the preparation work is out of the way, we're finally ready to launch custom firmware on the Switch. Unlike systems such as the DSi, Wii, or 3DS, Switch CFW is currently volatile- it will only work as long as your Switch is on. As soon as your Switch completely loses power for any reason (shutting down, battery dying, etc. ), CFW will no longer be active and you will need to follow these instructions again. Your Switch is now booting into Atmosphere. To verify Atmosphere launched properly, open the Settings applet, and navigate to System. You should see AMS next to the version number. You will now be able to launch the Homebrew Menu by by holding the R button while launching any game (including demos/cartridges), application (e.g. Youtube/Hulu), or the album. If R is not held, the album, game, or application will launch like normal. Using the album for the Homebrew Menu instead of a game or application has several limitations, including but not limited to: a smaller amout of available memory (RAM), as well as being unable to launch a full-featured web browser. It is strongly recommended to launch homebrew through applications or games instead. Place homebrew applications (.nro files) into the switch folder on your SD card. NX-Shell is a file explorer for the Switch. You can move files, listen to mp3's, view images etc. hbappstore is a homebrew app store where a large collection of switch homebrew is kept.